Protest organised by actors at the Polski Theatre in Wrocław, September 2016. Photographer: Natalia Kabanow, Archive of Polski Theatre in Wrocław underground. Working to make culture more democratic constitutes an integral part of the democratic campaign in society and politics. Over the last decade, social movements across Europe have achieved a great deal when it comes to managing culture organizations in a participatory manner, founding arts institutions that follow democratic decision-making protocols and creating autonomous centres oriented towards practicing culture in the spirit of what comprises the common good. Examples include a successful campaign for the legal recognition of public-social partnership in Croatia – a partnership enabling the foundation of such centres as the Pogon in Zagreb, which can be situated within the trend for ‘open institutions’ and which are programmed on the basis of democratic, transparent procedures.1 There's been reform in the statutes of French culture organizations operating on the basis of social economics and practicing participatory art and art made with the communities, such as the Têtes de l’Art in Marseille.2 The occupation, in Italy, of arts institutions by social movements, turning them into commons – ‘commoning’ them – and running them in accordance with legally sanctioned principles recognising the idea of common goods, as was the case with Rome’s Teatro Valle Occupato from 2011 to 20143 and, from 2012, with the ex–Asilo Filangieri in Naples (the latter having been further legitimised in that it was granted recognition by Naples’ municipal authorities hailing from urban movements4). The foundation (in Spain and elsewhere) of institutions capable of enhancing and enriching, in the spirit of participation, the cultural repertoires of the communities they work with and, in doing so, far exceeding the artistic take on culture and heading towards an anthropological approach, as is the case with MediaLab Prado in Madrid.5 And finally, ‘social culture’ – grassroots practices that create culture beyond arts institutions and the independent stage6 – flourish across Europe, and join these most frequently debated and discussed examples of achievements in shaping culture so it corresponds to the democratic aspirations of societies, giving voice to inaudible subjects and based on participation and communal civic decision-making. How is Democracy Faring in Arts Organizations? Despite all this, the theme of rendering public arts organizations and arts institutions more democratic is almost entirely absent from such debates. An astonishing lack, considering the size of the institutional area on the European map of culture-creating actors.7 When it comes to interventions in arts institutions, almost the only information that reaches the international circuit of social movements is that concerning the activities of Occupy Museums, which originated from the Occupy Wall Street movement. Occupy Museums is behind activists forcing their way into MOMA in New York City, and behind democratization-oriented activities at the KunstWerke gallery in Berlin, undertaken during the seventh Biennale for Contemporary Art curated in 2012 by artist Artur Żmijewski.8 However, set against the numerous ventures and achievements of social movements beyond the institution, the activity of group such as Occupy Museums appears very limited indeed, at first glance. Should this be taken to mean that the campaign for democracy is absent from the arts-institutional circuit? Not at all – but the main protagonists of this campaign are trade unions and the workers’ movement, both of which are frequently perceived by present-day democratic movements as systems that are part of an outdated tradition of social self-organization on the Left, unable to face new challenges involved in the struggle for democracy and civic self-determination. Reasons for this reserved attitude involve the fact that, during the last decade, emancipatory and democratic movements have followed divergent paths. Four traditions have been prevalent in the new democratic movement: the post-operaismo or workerist tradition, originally from Italy, emphasizing the autonomy of groups and individuals in relation to the market and the institution of the state, and prominence and support to actions that go against the grain of the traditional perception of the workers’ movement as rooted in the trade-union formula; the post-anarchic tradition that originated in Spain and combines Spanish anarchism, social-democratic influences and local-community movements – the 15 M Movement (the Indignados Movement), civic platforms at municipal level and the nationwide Podemos party all sprang from this tradition; the tradition of the international movement for common goods, derived from present-day organizations for civic society; and, in the case of the US and the Occupy Museums collective, the tradition rooted in the autonomist, individualist American anarchism developing from the Transcendentalist era to the epoch of the civil-rights movement, while conspicuously holding the so-called traditional Left at arm’s length. As a result, the workers’ movement can at times be integrated with contemporary democratic tendencies and campaigns for democracy: this is possible when it’s compatible with the trends described above, when it references the autonomy of the subject forced into precarity and searches for new forms of workers’ organization in the service industries and in cognitive and post-industrial capitalism. By contrast, the workers’ movement and the struggle for democracy almost always remain separated when the former stems from the syndicalist core which has trade-union organizations as its main vehicle. 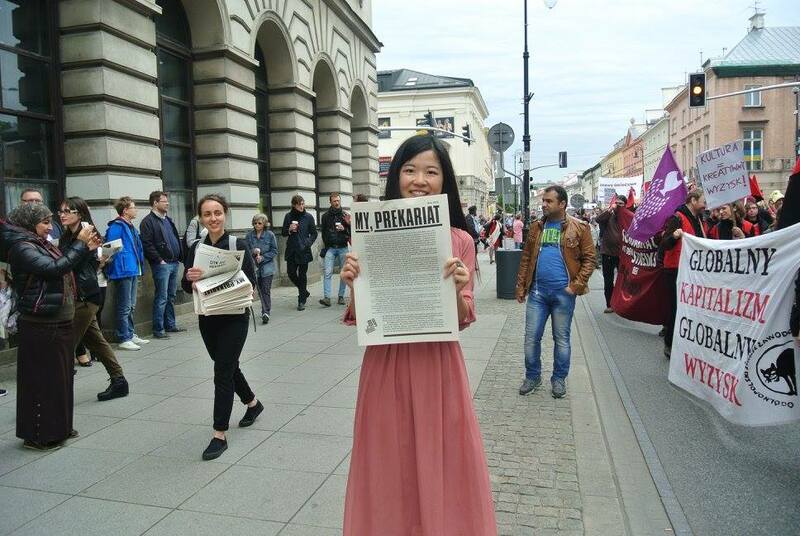 Manifestation ‘We, the Precariate’ campaign, 23.05.2015. Photo: Ogólnopolski Związek Zawodowy Inicjatywa Pracownicza. Source: facebook.com/myprekariat. An important proviso must be made at this point: readers who work in visual and performative arts (especially those familiar with the tradition of institutional critique) may find their eyes popping out on stalks as they see me assign only a marginal place to workers’ issues in contemporary democracy and culture analysis. Without a doubt, the condition of artists and arts-organizations staff as workers is one of the most frequently analysed issues. Curators, critics and researchers grouped around projects such as Former West (Gerald Raunig, Isabell Lorey),9 authors such as Bojana Kunst10 and, above all, the leading representatives of Italian post-operaismo (Antonio Negri, Sandro Mezzandra, Franco ‘Bifo’ Berardi)11 give much attention to this issue. However, their analyses gravitate towards questions concerning the precarious nature of artistic production and the production of subjectivity through creative work in the realities of service industries and cognitive capitalism. Hence the findings of these analyses can be applied beyond the institution, but when it comes to disputes concerning workers’ rights within the institutional circuit, their range is limited. What’s more, these analyses emphasize labour theory and artistic work as the theory’s practical equivalence; they turn too seldom towards the workers’ and trade-union movement in the arts as a phenomenon calling for an analysis independent of the context of artistic productions. In relation to the above observations, and based on the experiences of workers’ movements in Poland (particularly the trade-union movement) within the arts since 2009, I would like to defend the following propositions. First: the process of aspiring to make the arts more democratic must lay greater emphasis on arts institutions than it has so far. This field must be regarded as essential if the struggle for democracy in culture is to be successful Second: the workers’ movement (its trade-union incarnation included) plays a key part within the institution and where the creative work of individuals and arts organizations converge. Third: as I shall demonstrate, the foundation of unique trade unions is vital if democratic goals are to be attained (not every trade union has a positive impact on real democracy). Fourth: democratic movements in the present day must acknowledge the workers’ movement (including the trade-union movement) as an integral part at the fore of the campaign for social and political democracy to a greater extent than they have done thus far. In order to develop, analyse and defend the above propositions, I shall make use of the timeline of the Polish workers’ campaign within the arts (starting from 2009). This is because I’d like this analysis to also become a chronicle of arts-organization employees’ years-long (and, in places, extremely effective) efforts to improve the lot and welfare of workers, and a chronicle of their campaign for political democracy in our part of Europe. In light of all this, OFSW embarked on a campaign for regulating artists’ status as workers; the key moment of that campaign was 24 May 2012, when artists announced they were going on strike. They managed to persuade around fifty arts organizations to close on that day, as part of the action known as ‘A Day without Art’.14 ArtStrike, as the event was known, provided visibility to problems artists face, and provided an incentive for dialogue between arts organizations, national authorities (represented at the time by the liberal Civic Platform government, headed by Prime Minister Donald Tusk) and artists – with OFSW speaking for this last group. Issues of regulating the welfare status of artists and their situation as workers were discussed during the talks. WHC with workers and directors of CSW. Photographer: Gabriella Csoszó. The study conducted by the researchers revealed numerous tensions and conflicts between staff and management of the gallery, directed at the time by the curator Fabio Cavallucci. It emerged that, since spring 2012, staff had been campaigning for a change in the management’s approach to running the gallery, for staff to be granted greater subjectivity and given a say in programming events and managing CSW. When it came to the staff, the main role in the conflict was played by the CSW committee from Solidarity, the legendary trade union established in 1980 that made a substantial contribution to toppling the Communist regime in Poland. As co-operation between WHC and the CSW staff developed, the latter group became increasingly convinced that the conflict ought to be publicized, that artists working with CSW and pro-democracy grassroots activists ought to become involved; and the axis of the dispute ought to encompass both working conditions at the gallery and the pressing need for CSW to become more democratic, and that a formula for managing this public arts organization in a participatory manner needed to be worked out. On 24 September 2013, Solidarity members at CSW presented the public with documents they had been exchanging with the management since spring 2012. The conflict at the gallery thus became a public matter; shortly afterwards, Solidarity members announced their demands pertaining to the urgent need to make CSW – which, as an institution, is a common good – more democratic.16 At the same time, they became increasingly vocal in their demands for Cavalluci to step down from the post of CSW managing director. Between October 2013 and May 2014, CSW staff supported by WHC, artists collaborating with CSW, activists and arts-organization circles embarked on a campaign aiming to satisfy workers’ demands. Artistic instruments such as installations and performances, and activists’ means such as picketing, were employed, with engaged civic journalists joining the effort. The campaign proved effective as regards a single staff demand: in its aftermath, the minister of culture and national heritage announced he would not be renewing Cavallucci’s contract for a second term – then Cavallucci decided to leave his post four months before the end of his first term. In May 2014, he stopped serving as managing director of CSW. The crucial demand – making CSW more democratic – has not been met. Exhausted by their battle with the management, the staff, artists and activists didn’t have the stamina to continue their campaign, especially as a coalition of various loosely connected social actors. At that point, the idea emerged to embed further efforts of transforming the gallery to increase staff participation (also including artists working with CSW and grassroots activists) within the permanent staff structure – to transform this idea into a demand of the Solidarity trade union. The union, however, proved inadequate; it lacked the determination to shoulder a burden of this magnitude. A competition was announced and new management duly appointed, operating within an unchanged, hierarchical tension-triggering institutional structure. WHC’s instalation ’Institution in crisis’ outside CSW Castle. Photographer: Gabriella Csoszó. A threefold lesson can be drawn from the campaign for democratic transformation at CSW. First, the fact that the workforce had formulated calls for the gallery to be made more democratic in the name of culture, understood as a common good, demonstrates that there is cohesion between the identity of individuals as workers and the question of democracy. One might say the experience of hierarchy and relations of power within the field of work – whether paid, unpaid or invisible – is one of the most universal and acute experiences in the workplace: it stands for the inability to self-determine and take decisions related to oneself, and for a lack of subjectivity, autonomy and agency. Thus the worker is by definition a campaigner for democracy: for the abolition of social hierarchies and the acquisition of subjectivity and agency. Second, if the democratization process in a public arts organization is to be lasting, the structure it is embedded in must have strong legitimacy and instruments of pressure both on the management of the institution and on those who hold political power. A trade union is such a structure: in the case of CSW, it proved capable of taking on and fulfilling the role of the protagonist in the campaign for the rights of staff, artists and pro-democracy activist audience members. Third, however, not every trade union can find within its ranks sufficient determination and sensibility (both political and mindset-related) to consistently strive towards introducing staff participation, towards making power relations in arts organizations more democratic. Why did artists choose the Workers’ Initiative as their headquarters, within which they decided to establish their own committee? The initiative is a trade union established in 2001 which stems from the Poznań-based Anarchist Federation – one of the strongest anarchist collectives in Poland, some of whose activists have turned to syndicalism. The union’s first-ever committee was formed within the metallurgy industry, at the Cegielski factory in Poznań. The union has a clear anti-fascist, feminist, class and democratic profile. To an extent, it’s a confederation of autonomous committees; at the same time, given that it’s registered on the basis of regulations pertaining to trade unions and their work, it is a subject deeply rooted in the Polish legal order, which provides it with more robust instruments of pressure than those available to other subjects. In addition, the initiative is known for its experiments in introducing trade unions into new sectors, or sectors not usually associated with the trade-union movement (this includes the most precarized sectors, such as logistics, services – and the arts), whose unionization has been given up on by other union headquarters. The initiative’s involvement in causes beyond the workers’ movement (movements of tenants, antifascists, migrants and feminists) is also well known. The fact that, as the Art Workers’ Community Committee was being established, company committees in public arts institutions (the Theatre of the Eighth Day and the Arsenał gallery in Poznań, the Polski Theatre in Wrocław and the Dramatyczny Theatre in Wałbrzych) were part of the initiative, was an additional argument in favour of artists forming their own trade union. The establishment of the Art Workers’ Community Committee of the Workers’ Initiative National Trade Union has taken disputes about workers’ issues in the arts to a new level – up to that point, these disputes have been dealt with by OFSW. For one thing, they have extended beyond world of the visual arts, spilling over to other arts fields. Those working in literature, theatre and dance also became part of the committee. Second, the arts have clearly marked their presence on the agenda of workers’ rights and trade-union movements, alongside such sectors as industry, the health service, education, logistics, the building sector and the catering industry. Third, those working in the arts have organized themselves to become a part of a wider front of social movements, and could count on larger masses of people to be moved to act to solve the issues the arts are faced with. Fourth (and final), a trade union provided the opportunity to make an impact on the arts not only using soft instruments, such as open letters or peer pressure, but also hard ones, enshrined in the Trade Union Act and employment law – from court cases and workers’ pickets through industrial action. Unionization provided artists with a more definite collective subjectivity, increasing their agency and, consequently, their chances of self-determination. Thus it has contributed to giving artists a more advantageous position among social actors campaigning for democracy. The establishment of the Art Workers’Community Committee brought about the diversification of methods used to campaign for workers’ rights and for democratization. OFSW took up the duties of a professional pressure group involved in negotiations with partners representing the worlds of labour and politics, while the Art Workers’ Committee took responsibility for legal interventions and organizing picketing and demonstrations. The Workers’ Initiative Art Workers Committee immediately set about carrying out a number of discrete legal and protest interventions in arts organizations guilty of violating workers’ rights; it was also involved in manifestations of solidarity with other sectors. Finally, in early 2015, working alongside the union’s other committees, it initiated and organized the ‘We, the Precariate’ campaign. Its aim was to launch the struggle for unionizing precarized workers, and granting them humane and adequate working conditions, welfare safeguards and pensions. 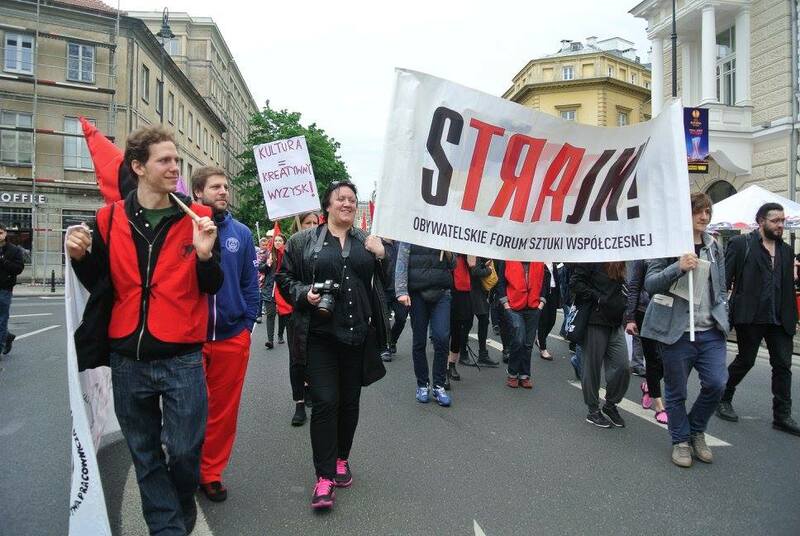 The peak of the campaign was marked with a demonstration through the streets of Warsaw on 23 May 2015, three years almost to the day after the artists’ strike. Along with artists, representatives of the health service, the construction industry, pre-school education, science, NGOs, logistics, services and the student community joined the demonstration and gave speeches. 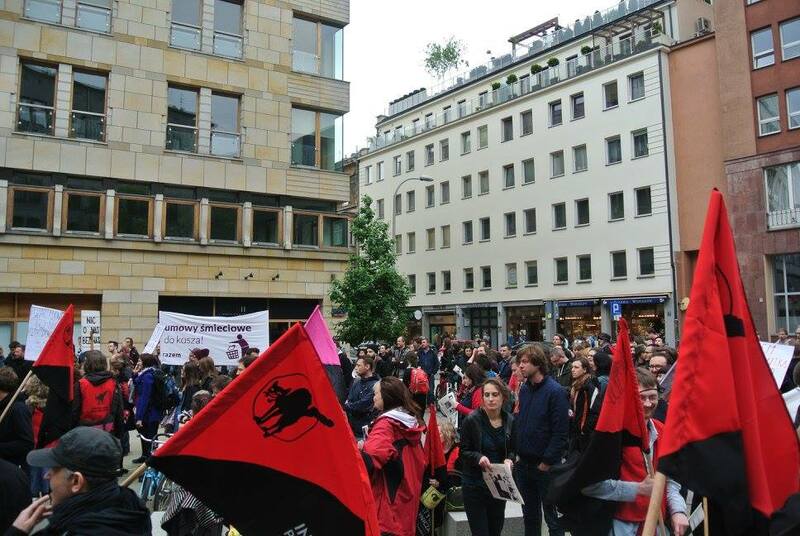 Representatives of fellow workers’ movements (Amazon workers from Germany and members of the Italian ESC and CLAP collectives,20 looking out for the interests of precarized workers and the self-employed, were among the speakers). The artists’ success in prompting wider masses of people to demonstrate in the name of precarious workers’ identity was a practical example of how the workers’ movement managed to legitimize problems plaguing the arts sector as a part of its mainstream agenda. At the same time, it was thanks to artistic circles that the building of an inter-sector bridge under the heading ‘precariat’ became feasible: as sociologist Jarosław Urbański, a co-founder of the Workers Initiative and a key figure in the current workers’ movement in Poland, has noted, ‘artists and arts-organization workers were relatively quick to adapt [to the term ‘precariat’]’;21 what’s more, the workers’ movement could be presented with new instruments because that term was analysed and because, above all, practical conclusions were being drawn from that analysis. In short, as demonstrated by the example of the ‘We, the Precariate’ campaign, artists are not only able to organize themselves within the workers’ movement – they are also capable of proposing new instruments and new identities as part of that system, thus increasing the motivating potential of the entire workers’ and trade-union movement. As it became increasingly difficult to achieve goals relevant to improving the lot of the precariat in the arts, the activity of the Art Workers’ Community Committee found itself on the wane. Certainly the committee can take credit for individual instances of speaking up for arts-organization staffs, and taking action when organizations failed to honour contracts signed with artists. In addition, the ommittee supported the work of OFSW (as its ‘armed forces’), and played a significant role in incorporating problems of the precariat into the broader campaign for workers’ rights. But it has been other sectors – NGOs, the catering industry, services and sectors that rely heavily on agency work (for example, the trade-union committee at Amazon) – that have continued precariat-related disputes. While work in other areas of the committee’s activity does continue, the bulk of the large-scale campaign for workers’ rights and the effort of providing the workers’ movement with new instruments conducive to debates on making the arts more democratic has transferred elsewhere: to trade-union committees in arts institutions. What’s more, these committees succeeded in taking the issue of democracy from within the institution into the political field: they have become instruments of the campaign not only for democracy in the workplace but also for political democracy. Perhaps the greatest achievement of the joint forces of the Civic Forum for Contemporary Art and the Art Workers’ Community Committee of the Workers’ Initiative National Trade Union was that they have contributed to raising awareness of arts-organization staff as workers. Combined with the committee’s recruitment efforts, this resulted in a crop of Workers’ Initiative Trade Union Company Committees in public arts organizations and artistic institutions. Since 2014, Workers’ Initiative Company Committees have been established in ten major organizations,22 carrying out typical trade-union tasks (improving working conditions ‘on the floor’) along with – given the change of government and the pressure exerted on the arts by the far right – going beyond the routine responsibilities of typical organizations campaigning for workers’ rights. In May 2016, six months after the far-right party Law and Justice had come to power, the post of managing director of the Polski Theatre in Wrocław became the object of a prolonged dispute. As in the case of CSW, the brunt of the ongoing dispute with the management and, indirectly, with the supreme local authorities and the Ministry of Culture and National Heritage, was borne by the trade union (in this instance, the Polski Theatre in Wrocław Workers’ Initiative company committee). However, in Wrocław, unlike at CSW, workers’ rights and the fight for democracy within the institution (acknowledging comments from staff, audiences and artists collaborating with the theatre) appeared on the agenda at the same time. The fight for political democracy was at stake, too: ‘We won’t give culture over to you’, the motto chosen by the Polski’s ensemble, was directed against the Law and Justice government, plainly alluding to the fact that political and civic freedoms had come under threat since the far right came to power. As Morawski failed to find a way to appease the situation, he set about dismissing defiant actors and other staff members responsible for decision-making: as a result, the theatre became almost deserted, and the managing director found it virtually impossible to put on productions because of cast shortages. In response to the dismissals, actors who were trade-union members decided to bring a case against the theatre to the employment tribunal, severely endangering the theatre’s financial viability. In addition, trade-union members at the Polski began to organize demonstrations in defence of their theatre, both in Wrocław and in Warsaw: these gatherings provided them with the opportunity to protest against the violation of democratic freedoms by Poland’s far-right government, as well. In an act of defiance, theatre staff called into being Polski Theatre Underground, a collective putting on engagé productions and performances in Wrocław’s public spaces, or taking advantage of the hospitality of other arts organizations.25 Let us also add that demonstrations organized in autumn 2016 by the Polski Theatre in Wrocław Workers’ Initiative enabled those working in the arts to contribute to the mass effort being made by Polish society to defend democracy and human rights, and to oppose the authoritarian inclinations of the Law and Justice government. Trials before the employment tribunal, the fact that the trade union continually blocked work at the theatre, anti-government demonstrations organized by theatre staff, and the work of the Polski Theatre Underground all combined to put pressure on the local authorities. As a result, those at the helm of the Lower Silesia province (the main organizers of the Polski Theatre in Wrocław) took the decision to dismiss Morawski from the post of the theatre’s managing director. The decision was questioned by the provincial governor (a member of the Law and Justice party) and by the minister of culture, who co-runs the theatre: the result has been a legal tangle which has so far remained unresolved. At the time of writing, the conflict surrounding the Polski Theatre in Wrocław has been going on for over a year. The fight that goes on at the Polski Theatre in Wrocław is the result of the transformation undergone by the arts in Poland: the identification of the artistic subject with the worker as subject. The dispute – a protest against a new managing director who has been imposed on the theatre – was from the start based on the trade-union structure within the institution, and the essence of that dispute was the demand that the subjectivity of the artists and their right to self-determination be acknowledged. Thus the dispute in Wrocław was about democracy in the workplace; it was a protest against artists being regarded as self-evidently positioned lower in the hierarchy of power, thus denied a say on who should be appointed as managing director. Given the unequivocally democratic and combative nature of the trade union running the campaign at the Polski Theatre in Wrocław, political democracy was the other (secondary) consideration of the dispute: in that sense, the dispute was directed against the far-right Law and Justice government. 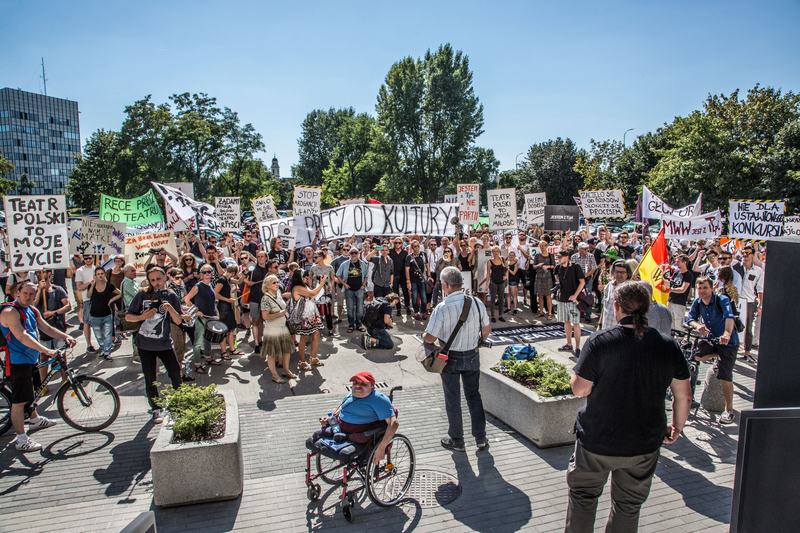 The Workers’ Initiative’s democratic and anti-right temperament has enabled it to run a political campaign beyond the confines of organizations – an attempt that failed during the dispute at CSW in Warsaw, where Solidarity had been the protagonist. As a formality, let’s add that the Polski Theatre in Wrocław had been the scene of a confrontation between two trade-union headquarters: Solidarity, whose structures are also part of the theatre, declared its support for the managing director who had been imposed on the staff by right-wing politicians, distancing itself unequivocally from any attempts to take the dispute beyond the theatre and make a reference to political democracy. Thus Solidarity demonstrated the inability of ‘old-school’ trade unions to campaign for democracy both within the arts and in society and politics. It would be an overstatement to claim that the dispute about democracy entered into by the workers’-rights movement in its trade-union guise within a public arts organization – the Polski Theatre in Wrocław – ended in success. Undoubtedly, however, the case of the Wrocław theatre demonstrates both that, when it comes to mindset, a trade union with a suitable profile is instrumental in conducting a long-term campaign to make the institutional arts circuit more democratic, and that it’s one of the key subjects in campaigning for democracy in politics and in society. The democratic aspirations of culture are revealed on (at least) three levels. First, at the level of an autonomous creative effort of groups and individuals who are incessantly engaged in the symbolization and aesthetization of reality, and who participate in negotiating collective values (one could call this level ‘culture-based’). Second, at the level of grassroots creative efforts of collectives, groups and social movements who aim to structure their work (and, as is often the case, to formalize it) with regard to types of organization (one could call this level ‘cultural’). And third, at the level of democratization-oriented campaigns in arts organizations – that is, disputes of staff, collaborating artists, audiences and pro-democracy activists with the management and with local and state authorities (one could call this level ‘institutional’). Inadequate recognition of the need to make the institutional tier more democratic may be a barrier dooming to failure the project of democratic culture and political democracy. To ensure that adequate recognition is granted, one must overcome the reserve with which present-day social movements regards the workers’ movement in its trade-union guise. In an arts organization, the trade union is the most effective form of self-organization: capable of engaging in prolonged campaigns and struggles for working conditions, for a democratic approach to workers’ issues in arts organizations and for democracy in society and politics. Examples of the struggles going on in Poland in recent years, referenced in the present text, show that suitably profiled trade-union headquarters – that is, stemming from the anti-fascist, feminist and class tradition – are the key protagonists of democratization-related disputes at the institutional level, and major actors in the struggle for democracy in society and in politics. The fact that the trade-union movement is more widely accepted by Polish (and Central and Eastern Europeans) activists in pro-democracy social movements is due to the renown enjoyed by trade unions in the region attributable to the historic role of the Solidarity trade union in toppling Communist regimes across the former Eastern bloc. This renown also translates into the workers’ movement being more firmly rooted in the law than elsewhere on the continent: notwithstanding sustained pressure from neoliberal reformers, unions in Poland and other countries in the region still have at their disposal a significant number of effective instruments for influencing employers and those who hold political power. In other words, in Central and Eastern Europe, it’s easy to perceive the workers’-rights movement as a natural part of today’s progressive social movements. Still, even in our region it’s obvious that not every trade-union headquarters is capable of exerting a positive influence on democracy. Solidarity, for one, very often sabotages efforts by the Workers’ Initiative and similar trade unions to make the arts more democratic. The two unions have stood face to face in opposition at the Polski Theatre in Wrocław and elsewhere. Thus it’s primarily the unions stemming from anarchist and syndicalist traditions that ought to win the full acceptance of present-day pro-democracy social movements. That process is slowly taking place. As an arts practitioner, a socio-political activist and a member of the Workers’ Initiative trade union, I was delighted to see my home union host the inaugural meeting of the network Transnational Social Strike in 2015. The network was established on the initiative of the representatives of Italian post-operaismo, who desired that the ‘social strike’ experiment become international. It’s time for the anarcho-syndicalist workers’-rights movement to also find approval with pro-democracy arts activists whose roots are in post-anarchism, and in the movement for the common good and for human rights. 1. See Open Institutions: Institutional Imagination and Cultural Public Space, eds. Teodor Celakoski, Miljenka Buljević, Tomislav Medak, Emina Višnić (Zagreb: Alliance Operation City, 2011) and the conference website for ‘Open Institutions: Institutional Imagination and Cultural Public Space’ (Zabreb, 20–23 January 2011), http://bit.ly/2tpvWBr [accessed on 22 July 2017]. 2. See P. Eynaud, S. Khebizi, ‘Participatory Art as a Vector of Innovative Governance: Reflexivity at the Heart of the Formalisation Process’, in Build the City: Perspectives on Commons and Culture, eds. C. Beckett, L. Gablier, V. Paulissen, I. Stokfiszewski, J. Tokarz-Haertig (Amsterdam, Warsaw: The European Cultural Foundation / Krytyka Polityczna, 2015), pp. 279–294. 3. See the archive of Teatro Valle Occupato’s work, http://www.teatrovalleoccupato.it [accessed on 22 July 2017]. 4. About the legalization of the occupation of ex–Asilio Filangieri and other social centres in Naples, see http://bit.ly/2tz6iOO [accessed on 22 July 2017]. 5. See the article about MediaLab Prado on the European Cultural Foundation website, ‘Medialab-Prado: Creating a Community and Learning to Live Together’, http://bit.ly/2vOV09D [accessed on 22 July 2017]. 6. See No Culture, No Europe: On the Foundation of Politics, ed. Pascal Gielen (Amsterdam: Valiz, 2015); Igor Stokfiszewski, ‘Wokół kultury społecznej’, in Kultura I rozwój. Analizy, rekomendacje, studia przypadków, eds. Jerzy Hausner, Izabela Jasińska, Mikołaj Lewicki, Stokfiszewski (Warsaw, Kraków: Instytut Studiów Zaawansowanych, Fundacja Gospodarki i Administracji Publicznej, 2016), pp. 199–221; Igor Stokfiszewski, ‘On Social Culture: Manufacturing Commonality Beyond Cultural Institutions and Independent Artistic Scenes, in Culture and Development: Beyond Neoliberal Reason, ed. Stokfiszewski (Warsaw: Institute for Advanced Study, 2017), pp. 105–126. 7. For instance, approximately fifteen thousand public-arts organizations are in operation in Poland – this excludes cinemas, and only includes theatres and musical institutions with permanent ensembles. According to information provided by the Central Statistical Office of Poland for 2013, ‘Poland had 822 operational museums and museum branches, 170 theatres and musical institutions with their own permanent ensembles, 3,901 community arts centres and day clubs, 337 galleries and art salons, 469 permanent cinemas and 9,920 public libraries and library-and-information centres’, http://bit.ly/1NhHoO [accessed on 22 July 2017]. 9. See FORMER WEST, a contemporary art-research, education, publishing and exhibition project (2008–2016), http://www.formerwest.org [accessed on 22 July 2017]. 10. Bojana Kunst, Artist at Work: Proximity of Art and Capitalism (Alresford: Zero Books, 2015). 11. See EuroNomade, which collects the greatest number of statements from Italian post-operaists, http://www.euronomade.info [accessed on 22 July 2017]. 12. 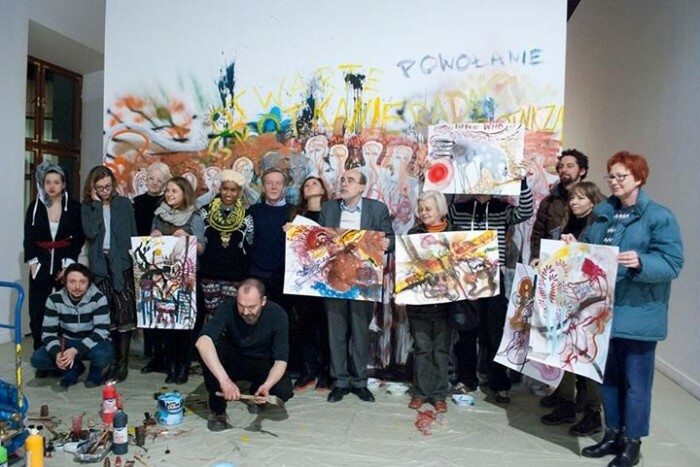 OFSW activists include leading Polish artists and critics Katarzyna Górna, Artur Żmijewski, Zuzanna Janin, Zbigniew Libera, Julita Wójcik, Jacek Niegoda, Joanna Rajkowska, Karol Sienkiewicz, Mikołaj Iwański, Rafał Jakubowicz, Łukasz Surowiec and Stanisław Ruksza. 13. This was also due to artistic circles’ increased interest in discourses concerning contemporary capitalism and work theory. As a result, artists acquired instruments of defining their condition from the perspective of their positioning in relations at work. One manifestation was the publication of the volume Czytanki dla robotników sztuki. Kultura nie dla zysku, Issue 1 of the series Wolny Uniwersytet Warszawy, eds. Katarzyna Chmielewska, Kuba Szreder, Tomasz Żukowski (Warsaw: Fundacja Bęc Zmiana, 2009). 14. An appeal published in conjunction with the artists’ strike: ‘For years we have been hearing how successful Polish artists are. Politicians are eager to use artists to create a positive image of Poland abroad – we have seen this during the Polish presidency of the European Union in 2011. One could get the impression that artists are privileged. Nothing could be further from the truth! Only a small percentage of arts budgets is allocated to those who actually make art. Art is made by artists who are dedicated, work hard, and invest huge amounts of time and means. They take risks, and they are alone in taking them: no one takes responsibility for their welfare. No systemic solutions recognizing the unique character of the artistic profession are in place in Poland. Those who make culture and get involved in the life of society, improve the quality of urban spaces and the living standards of their residents. The work of artists translates into the appeal of cities and of the country as a whole, it is the stuff that social and symbolic capital is made of. Artists create common goods: municipal promotion offices, real estate developers, the tourism industry and each individual citizen all benefit from their work. Meanwhile, the majority of those who create culture are poor. Without permanent employment, artists struggle to make ends meet. They work a lot, yet their earnings are low and irregular. They are also the first to fall victim to budget cuts in arts organizations and unfavourable changes on the job market. Artists are not business people, they don’t work with profit in mind. Some works – frequently those of the greatest significance to society – are not even sellable. Many artists, even those who already have their own encyclopedia entries, remain outside the health-insurance and pension-contributions system. We demand that work begins on creating a system that would not leave artists at the margins of society! We appeal to the government to enter into talks with artists! A DAY WITHOUT ART is an artistic strike. The closing of galleries and museums as a manifestation of solidarity with those who make culture attempts to draw the attention of the government and the public to the problems faced by artists. The strike shows what a world without art would be like. Polish culture may face a similar end in but a few years’ time!’. http://bit.ly/2wOXVfh [accessed on 22 July 2017]. 15. During its intervention at CSW, the Winter Holiday Camp group comprised the artists, critics and writers Paweł Althamer, Raquel Gomez Amborosio, Tal Beery, Imani Jacqueline Brown, Antonio Calleja-Lopez, Maureen Connor, Gabriella Csoszó, Noah Fischer, Federico Geller, Zuzanna Ratajczyk, Dorota Sajewska, Igor Stokfiszewski, Joulia Strauss, Paula Strugińska, Martyna Sztaba, Zofia Waślicka, Katarzyna Wąs and Artur Żmijewski. For principles by which the group operated and its intentions towards those in charge of CSW, see ‘Together We Can Change CSW: a Letter by the Winter Holiday Project Working Group’, KrytykaPolityczna.pl, 8 October 2013, http://bit.ly/2vZXAJk [accessed on 22 July 2017]. For work by the WHC group at CSW, see Iwo Zmyślony, ‘System nas wykorzystuje. Rozmowa z Winter Holiday Camp’, dwutygodnik.com, 124:1 (2014), http://bit.ly/1OvjiZu [accessed on 22 July 2017]. 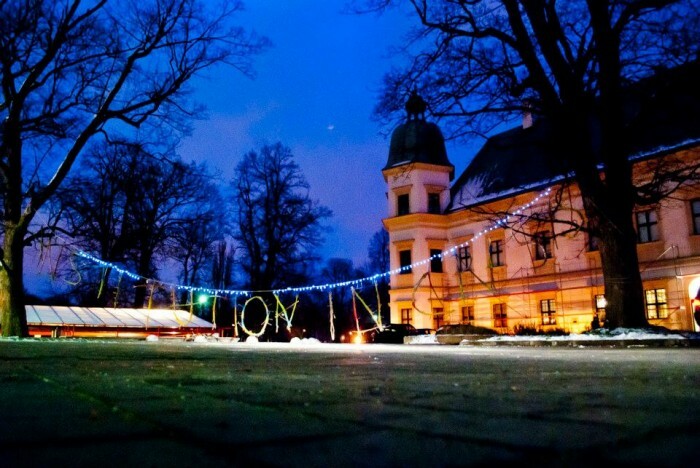 For the CSW intervention from the point of view of WHC members, see ‘It’s Art-Politics: Artur Żmijewski on the Reform of Exhibition Institutions’, in Barbora Kleinhamplová, Tereza Stejskalová, Who Is an Artist? (Prague: Academy of Fine Arts in Prague, 2014), pp. 98–113, http://bit.ly/2uGn1eP [accessed on 22 July 2017]. For the work of WHC from the point of view of CSW workers, see Adam Mazur, ‘Dobry duch Zamku. Rozmowa z Marianną Dobkowską’, magazynszum.pl, 20 December 2013, http://bit.ly/2vjTkB [accessed on 21 July 2017]. The course of events during the dispute at CSW can be reconstructed on the basis of my articles published in agreement with CSW employees and the WHC group on the website of Krytyka Polityczna:[all accessed 22 July 2017]: Igor Stokfiszewski, ‘Zamek Ujazdowski nie jest wyjątkiem’, KrytykaPolityczna.pl, 20 September 2013, http://bit.ly/2vsbflG; ‘Zamek Ujazdowski jestdobrem wspólnym’, KrytykaPolityczna.pl, 9 October 2013, http://bit.ly/2w0f3Bm; ‘Chodźmy do CSW!’, KrytykaPolityczna.pl, 20 October 2013, http://bit.ly/2uxIBqI; ‘Czy Rada Programowa pomoże CSW?’, KrytykaPolityczna.pl, 7 November 2013, http://bit.ly/2wDfOOV; ‘Zamek strachów, Centrum wyobraźni’, KrytykaPolityczna.pl, 11 January 2014, http://bit.ly/2wDkbJy. WHC’s intervention at CSW inspired Oleksij Radyński, Paula Strugińska, Zofia Waślicka and Artur Żmijewski to work on the special issue of Krytyka Polityczna, 40–41 (2015); subtitled ‘A Critical Institution’, it discussed the democratic transformation of arts organizations and included interviews with CSW management and employees, and other materials..
16. The demands of CSW staff formulated on 8 October 2013: ‘WE DEMAND! 1. That the CSW’s financial situation and the CSW strategy of financial management be presented in a clear manner; 2. That the subjective nature of work at CSW be restored, the practice of treating staff as ‘instruments’ abandoned, and that staff be granted civilized working condition as stipulated by the Employment Law; 3. That the extreme centralist management and organization model in place at CSW be abandoned, as it is unfit for an institution aspiring to create living culture; 4. That artists who collaborate on the CSW programme be paid; 5. That the organizational chaos – the result of tasks and funds being distributed according to poorly defined criteria – that has been prevalent at CSW for the past three years be brought to an end; 6. That the burdensome employee rotation be prevented by curbing the practices of unjustified dismissals and taking on new employees whose responsibilities are not clearly defined. If that condition is not met, no team worthy of its name can be established; 7. That the practice of managing the institution through repressions, orders and bullying be abandoned in favour of a culture of dialogue, participation and genuine involvement; 8. That the material produced by CSW be presented to the public in an honest, fact-based manner and critical debate on that material be enabled. Our audiences and the media must be addressed clearly, instead of being offered success propaganda conveyed by means of white noise; 9. That exhibitions and other artistic projects be planned in advance, so as to enable efficient fundraising, promotion and implementation; 10. That decision-making processes be rendered more democratic, a professional discussion on the CSW programme be restored, and that projects completed as part of the Curators’ College be evaluated; 11. That different arts and different types of activity undertaken by CSW be treated equally, in keeping with the institution’s interdisciplinary nature.’ ‘Trade Unionists’ Letter to the CSW Managing Director, and Staff Demands’, http://bit.ly/2vjGvsZ [accessed on 22 July 2017]. 17. After its programme conference, the Art Workers’ Community Committee issued the following statement regarding its goals and premises: ‘The Art Workers’ Community Committee of the Workers’ Initiative National Trade Union was constituted on 25–26 January 2014, bringing together more than 100 people from across the country. We have formed our union with a view to taking robust action for improving the livelihoods of artists, performers, those working in freelance artistic professions and other people working in the arts, and to ensure their welfare rights are observed to a greater degree than they have been so far. We come from all walks of art: the visual arts, film, theatre, literature and music. Within these fields, we practice different professions: we are artists, curators, actors, critics, directors, lecturers, etc. What we have in common is an absence of welfare safeguards and a lack of prospects. We take the view that culture cannot be practiced by exploiting those who produce it. We extend our solidarity to workers in other sectors whose circumstances are similarly dire. We also wish to express solidarity with all those who regard the fight for workers’ rights as a vital part of the campaign for equality and civic liberties. Our goals are: (1) to campaign for the implementation of advantageous solutions regarding pay, national insurance and pensions for workers in the arts sector; (2) campaigning for culture that is free from exploitation and observes the rules of democracy and human solidarity; (3) we will campaign for the committee to gain genuine influence on the shape of the arts and on (4) improving the quality of life of citizens at large’. A vote was held, and the following members were elected to the first-ever Art Workers’ Community Committee of the Workers’ Initiative National Trade Union executive committee: Maria Czykwin, Katarzyna Górna, Mikołaj Iwański, Rafał Jakubowicz, Szczepan Kopyt, Igor Stokfiszewski, Justyna Tafel, Rafał Urbacki and Wojtek Zrałek-Kossakowski. For a commentary and an elucidation of the legal and financial situation of Polish artists, and their status as workers, see Igor Stokfiszewski, ‘Z punktu widzenia prawa pracy artyści nie istnieją’, KrytykaPolitczna.pl, 10 February 2014, http://bit.ly/2hRHQTv [accessed on 22 July 2017]. 18. See Igor Stokfiszewski, ‘Koniec z niepłaceniem artystom’, KrytykaPolityczna.pl, 17 February 2014, http://bit.ly/2wARnRU [accessed on 22 July 2017]. 19. Czarna księga polskich artystów, eds. Katarzyna Górna, Karol Sienkiewicz, Mikołaj Iwański, Kuba Szreder, Stanisław Ruksza, Joanna Figiel (Warsaw: Wydawnictwo Krytyki Politycznej, Obywatelskie Forum Sztuki Współczesnej, 2015). 20. Campaign materials are available at https;//myprekariat.wordpress.com/. An appeal regarding the campaign and other relevant materials can be found at the Workers’ Initiative National Trade Union website, http://ozzip.pl/. The campaign anddemonstration bulletin are at http://bit.ly/2vtGIOt [accessed on 22 July 2017]. Reports on the campaign and the 23 May 2015 demonstration are at https://facebook.com/myprekariat. See also Igor Stokfiszewski, ‘My, Prekariat’, KrytykaPolityczna.pl, 1 May 2015, http://bit.ly/2vpN3GV [accessed on 22 July 2017]. 21. Jarosław Urbański, Prekariat i nowa walka klas. Przeobrażenia współczesnej klasy pracowniczej i jej formy walki (Warsaw: Instytut Wydawniczy Książka i Prasa, 2014), p. 200. 22. As of July 2017, the list of Workers’ Initiative Committees in arts organizations comprises company committees at the Polski Theatre in Wrocław, the Wrocław Contemporary Museum, the Dramatyczny Theatre in Wałbrzych, the Polski Theatre in Bydgoszcz, the Bunkier Sztuki Gallery of Contemporary Art in Kraków, the National Stary Theatre in Kraków, the Arts Centre in Płock, the National Audiovisual Institute in Warsaw, the Zbigniew Raszewski Theatre Institute in Warsaw, the Powszechny Theatre in Warsaw. POLIN Museum of the History of Polish Jews in Warsaw, and in Poznań at the Theatre of the Eighth Day Inter-Company Committee and the Polish Dance Theatre and the Municipal Arsenał Gallery. 23. See Igor Stokfiszewski, ‘Dlaczego rząd przegra wojnę o kulturę’, Dziennik Opinii, 285 (1485) (11 October 2016), http://bit.ly/2uMOk79 [accessed on 21 July 2017]. 24. The dispute surrounding the Polski Theatre in Wrocław can be traced based on press reports archived at e-teatr.pl, http://bit.ly/2wAsjL0 [accessed on 21 July 2017]. A report of the first eight months of the dispute can be found at the Workers’ Initiative trade union bulletin, ‘Wielomiesięczna walka związkowców z Teatru Polskiego’, Biuletyn Związkowy Inicjatywa Pracownicza, 47: 4 (2017), p. 3. See Tomasz Lulek and Piotr Rudzki, ‘Nie oddamy wam kultury! – wywiad z Tomaszem Lulkiem I Piotrem Rudzkim z IP przy Teatrze Polskim we Wrocławiu’, Biuletyn Związkowy Inicjatywa Pracownicza,47:4 (2017), pp. 4–5. 25. It’s worth adding that the Polski Theatre Underground is not the only independent entity called into being as a result of the crisis at the theatre. A group of engaged audience members organized themselves to form the t[p]l Audience’ collective, which went on to become an association whose aim is to provide representation and a voice of theatre audiences in all decisions pertaining to the Polski Theatre.